Kigo Video Converter Pro is an excellent video editing tool for Mac users to set video effects, add text / picture watermarks and crop videos' size. It's also a YouTube downloader to save and convert videos from YouTube and other online website videos. Kigo Video Converter Pro is an all-in-one video converter which supports all popular video formats including FLV, MPEG1, MPEG2, MP4, 3GP, 3G2, MOV, AVI, M2TS, MPEG TS/TP (for HD videos), etc for iPod, iPhone, iPad, PSP, PS3, Apple TV, Creative Zen, Archos and so on with high output quality and high conversion speed. 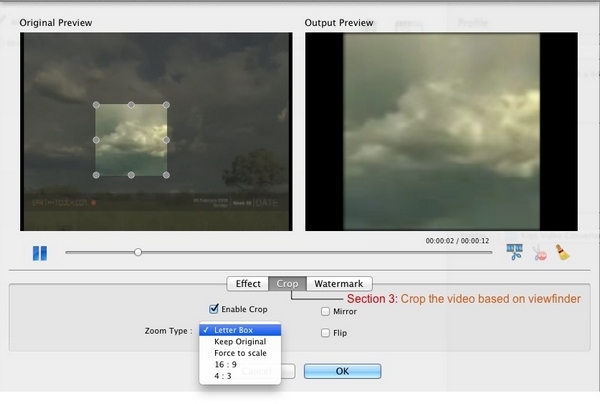 Click Edit effect icon to open the effect window and play video automatically in the Original Preview and Output Preview without any effects. Check on Enable Crop and then the crop frame will show up in the Original Preview window. The Output Preview will display the pictures from viewfinder. When Checking on Enable Crop, click the drop-list to set the Zoom Type such as Letter Box, Keep Original, Force Scale, 16:9 and 4:3. And you can add other effects by checking on Mirror and Flip. 1. Drag and resize the crop frame can custom the viewfinder. 2. Changing the cropped and effects is independent with each other.